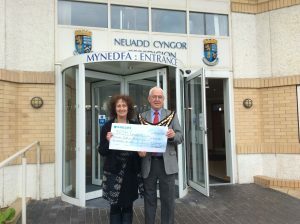 On April 20, the official dinner of the Chair of Ceredigion County Council was held and a collection was made to support the charity of the Chair’s choice. The Chairman of the Council, Councillor Lynford Thomas chose DASH. Once again DASH is most grateful for the support shown from the community it serves. Many thanks to all involved.